Who can forget the vulnerable childhood experience of going to the doctor? I remember sitting nervously on that white butcher paper, feeling like a particularly choice deli cut, and staring at a painting of a little boy pulling his pants down for a shot — a foreboding image of what might be in store. 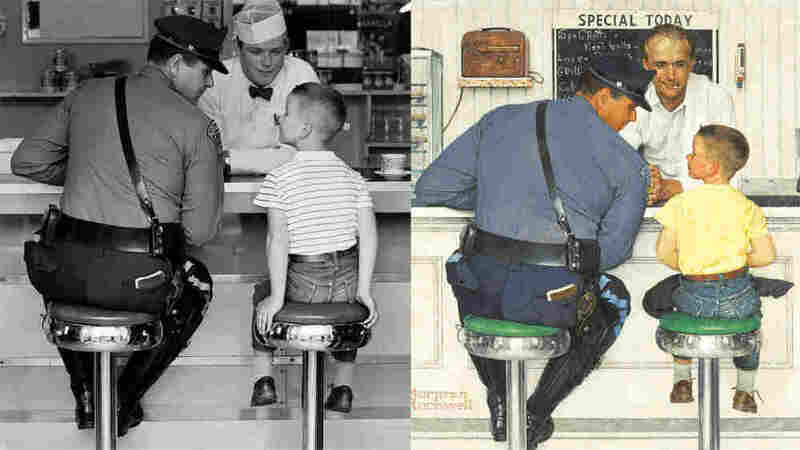 That image, a Norman Rockwell illustration, stuck with me for years. And that's the nature of Rockwell's legacy: his work is everywhere, and has become an indelible part of American culture. So, as someone who looks at photos all day, imagine my shock when I saw a photograph of the exact doctor's office scene in that painting. Rockwell used photos, taken by a rotating cast of photographers, to make his illustrations — and all of his models were neighbors and friends, including that little boy! 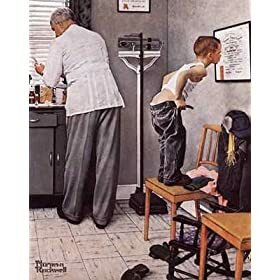 Rockwell never kept it a secret, but for some reason this little fact has been neglected in recent decades. Although he may not have clicked the shutter, Rockwell directed every facet of every composition. A little girl with a black eye, an elderly woman saying grace with her grandson, a boy going to war: Rockwellian scenes represent a certain sentimental America — an ideal America, or at least Rockwell's ideal. Over the course of 47 years, he had more than 300 cover images for Saturday Evening Post magazine. Then he went on to create more for Look Magazine. But those illustrations might never have existed without the help of photography. 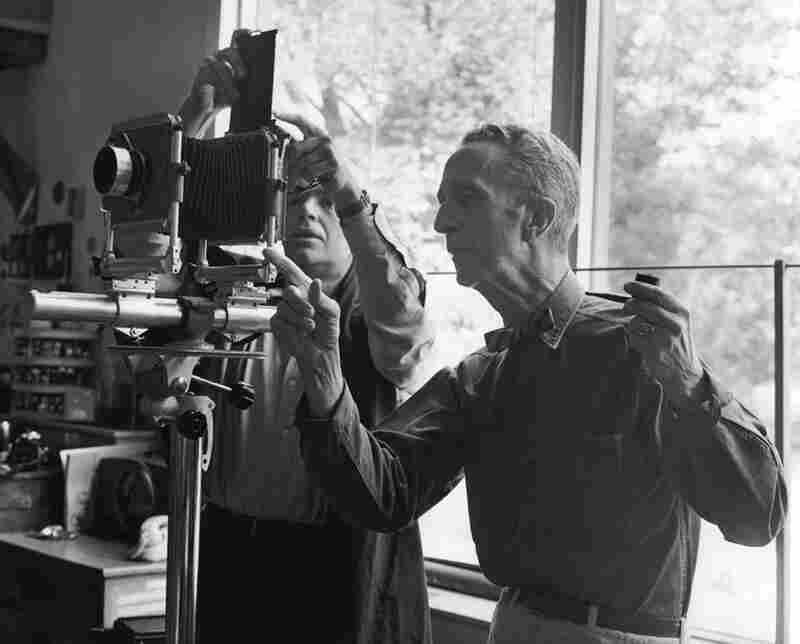 A new book, Norman Rockwell: Behind the Camera, reveals Rockwell's use of photographs in his illustrative process. 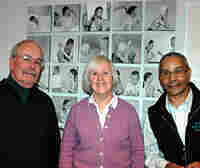 There's also a companion exhibition at the Norman Rockwell Museum in Stockbridge, Mass. While getting permission to use some of the photographs for an online gallery, I was told that for two of the images, I would need to speak to Clemens Kalischer — a name that appears nowhere in the book or in the exhibition. On the other end of the phone line came a gravelly and reticent voice — a voice with quite a story. NPR's Jacki Lyden went up to Stockbridge to speak to him in person. 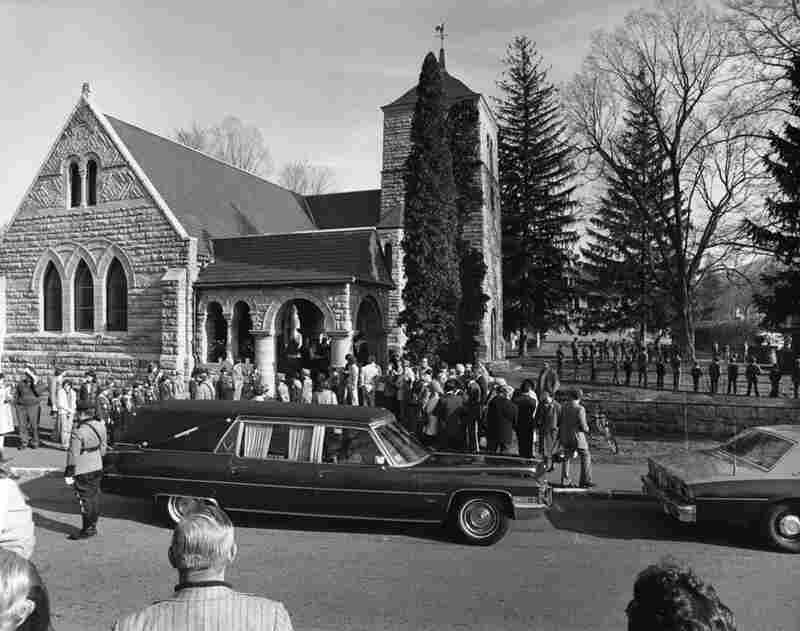 A German immigrant and young artist-photographer, Kalischer, now 88, moved to Rockwell's small town of Stockbridge in the 1950s. He was approached by one of Rockwell's usual photographers, Bill Scoville, who had a nervous condition and needed support while working. Kalischer reluctantly assisted Rockwell through the years — driving him to the White House to photograph Lady Bird Johnson, for example. But he has kept the photographs to himself and has remained quiet until now. To Kalischer, the American mainstream has misunderstood Rockwell. "There is a difference between advertising and art," he wrote in an e-mail. "Good artists have total control over their work and express their own vision, while searching for truth." And, Kalischer repeatedly emphasizes, Rockwell never considered himself an artist, but rather a commercial illustrator. An artist-photographer himself, Kalischer was at odds with the tracing techniques and saccharine subject matter in Rockwell's work. After all, Rockwell never painted freehand, and almost all of his paintings were commissioned by magazines and advertising companies. 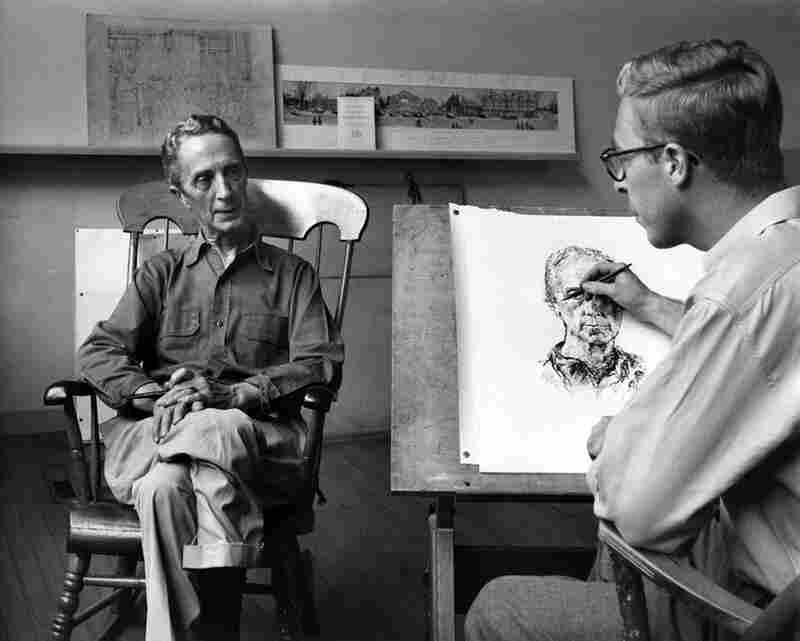 Norman Rockwell, although known in popular culture as a painter, never referred to himself as an artist, but rather as an illustrator. From behind the camera, he had the meticulous eye of a film director, as almost all of his works were traced from photographs. Here, he works with photographer Bill Scoville. 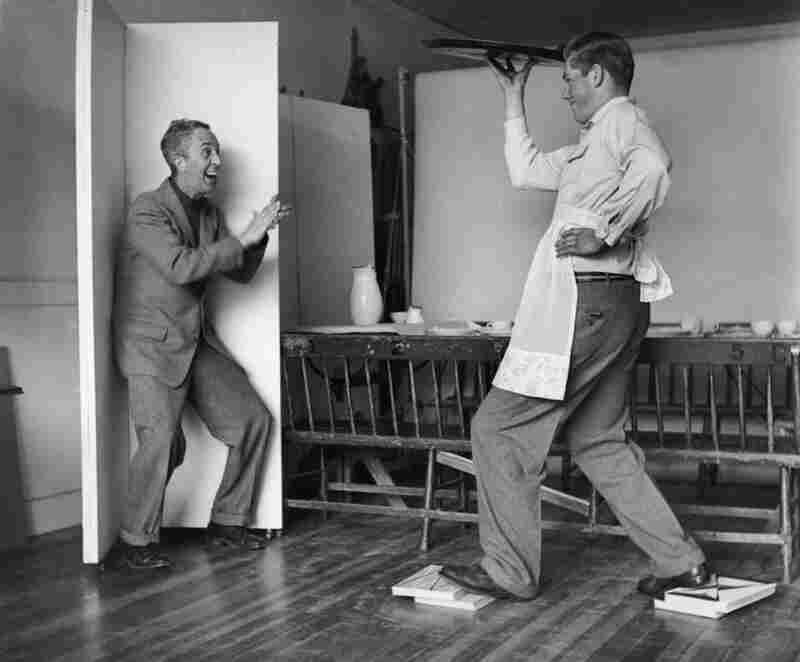 Rockwell, shown here in 1957, would often jump in front of the camera himself, directing models in their every gesture. The photographer here is Clemens Kalischer. 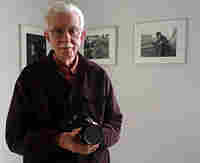 A young artist and photojournalist, Kalischer moved to Rockwell's town of Stockbridge in the 1950s, and was asked to help with a few shoots. Kalischer reluctantly agreed to help his neighbors by shooting photos for Rockwell's illustrations. 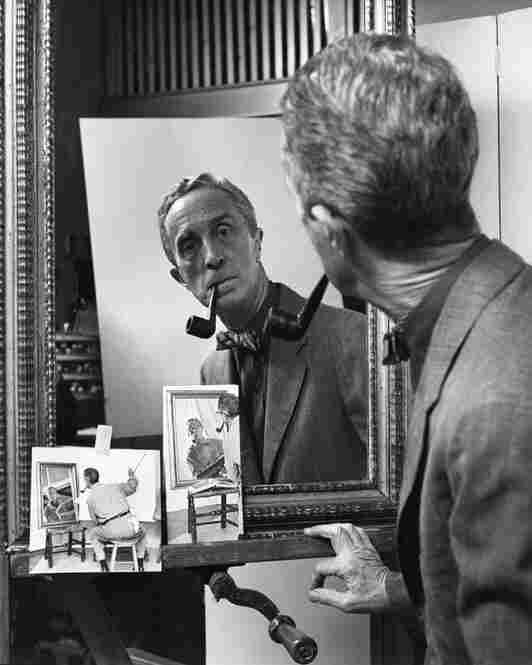 But he also worked as a documentarian, taking pictures of Rockwell and his models as they worked. Here, in 1958, Rockwell writes a check to child model Ed Locke after staging what would become the iconic illustration Before the Shot. Although Kalischer pursued his own career in photography and has exhibited around the world, he continued to help Rockwell through the years. 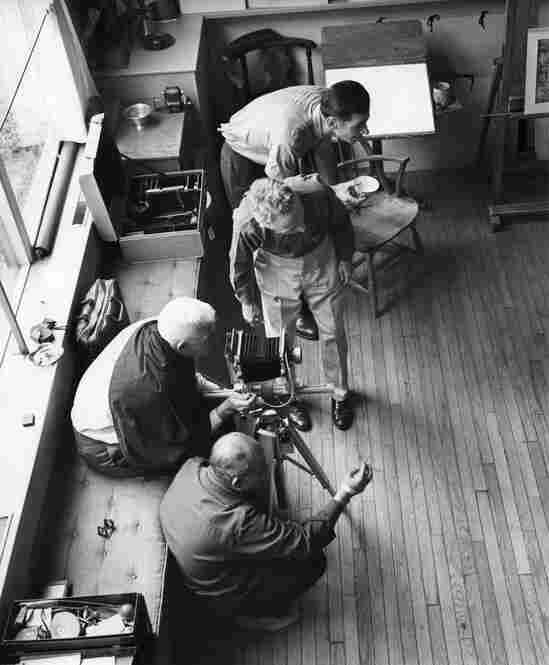 Here, Rockwell reviews images in his studio in Stockbridge. Upward of 100 photographs were shot for every illustration. Kalischer has always been reluctant to associate himself with Rockwell's work. 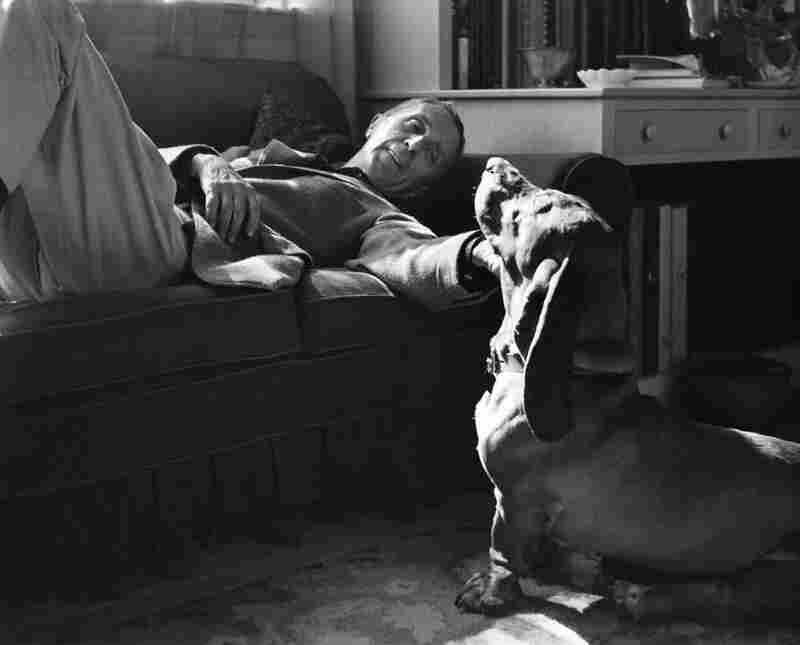 His photographs appear in neither the exhibition at the Norman Rockwell Museum nor in the book Norman Rockwell: Behind the Camera. Here, in 1958, Rockwell works with model Tom Carey. With hundreds of photographs from behind the scenes, most never before seen, Kalischer's archive is a gold mine of cultural history. Rockwell would tell the photographer exactly how to compose the picture, but would never click the shutter himself — perhaps a point of contention for an independent artist-photographer like Kalischer. 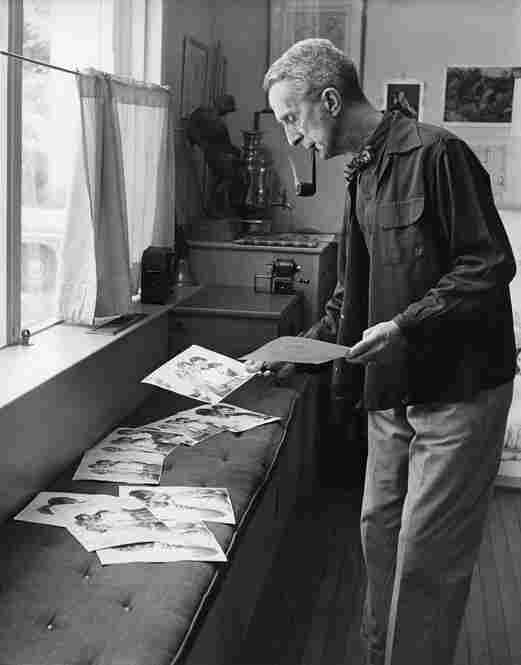 According to Kalischer, Rockwell sometimes expressed dismay that he relied so heavily on photographs. But other critics might argue for the artistic merits of Rockwell's command of light, composition and human form. Here, he sits in a study for Triple Self Portrait in 1960. Rockwell works with two photographers, Bill Scoville and Louie Lamone, in his Stockbridge studio, while Kalischer documents the process. Kalischer would even drive Rockwell to various shoots. 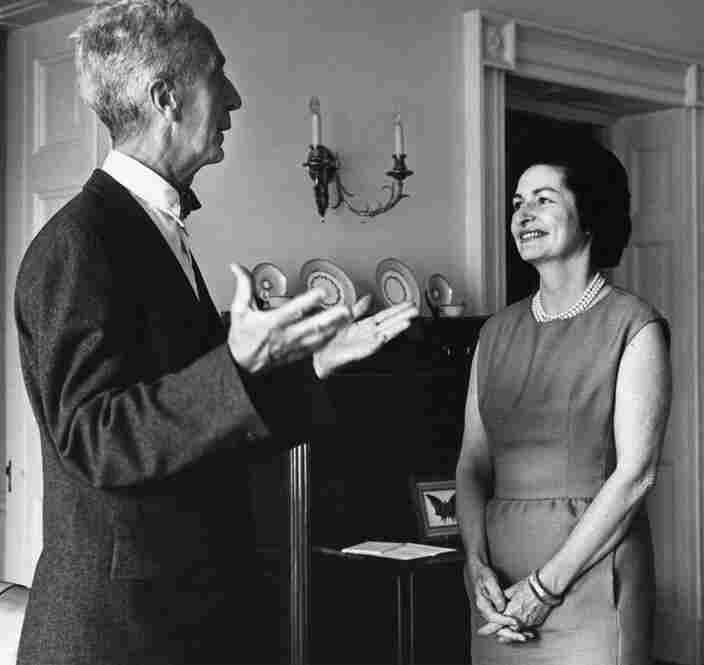 He accompanied him to the White House, for example, to photograph Lady Bird Johnson in the early 1960s. 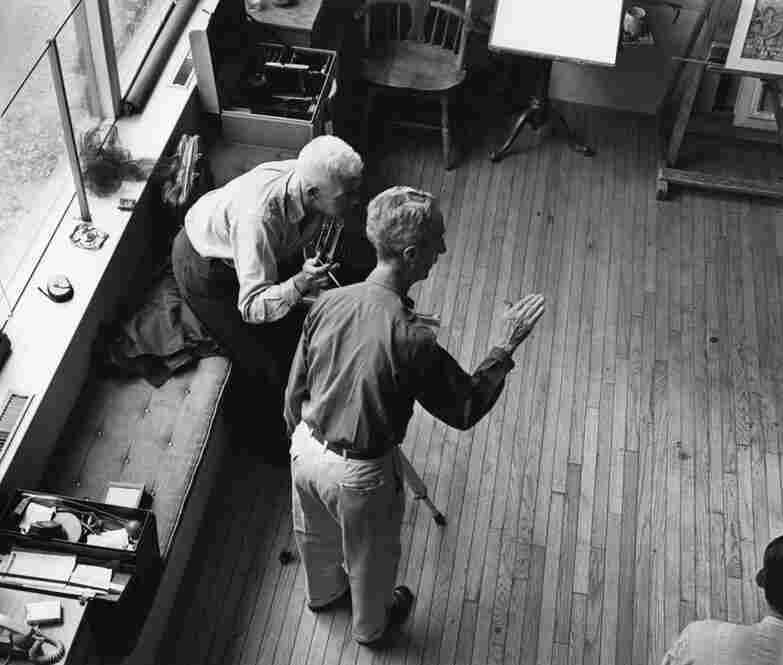 In addition to photographing Rockwell on the job, Kalischer also captured the quieter moments. 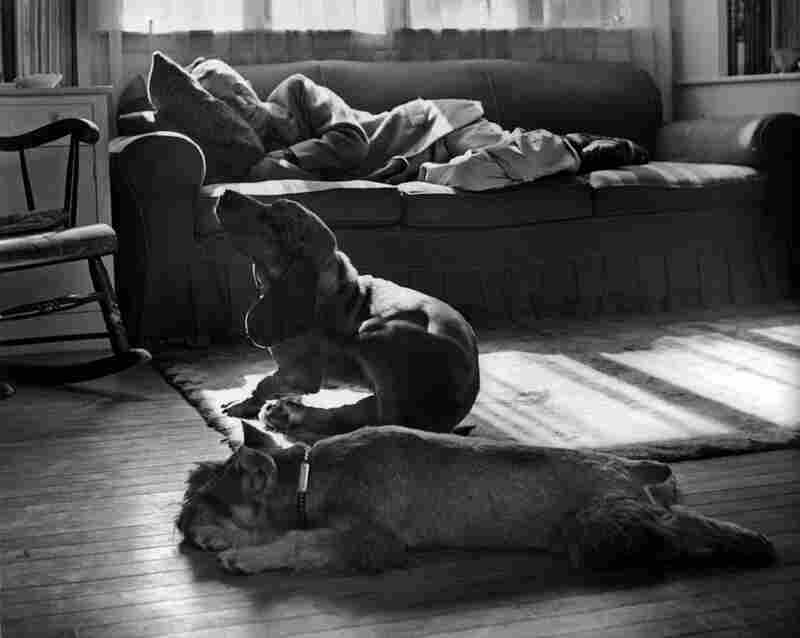 Rockwell rests in his studio with his dogs, circa 1960s. 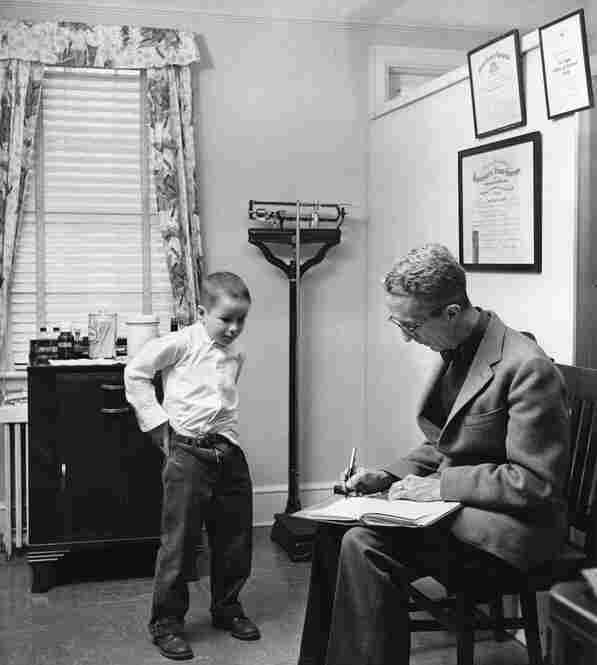 Rockwell sits as his son Jarvis draws a portrait in Stockbridge, circa 1960s. 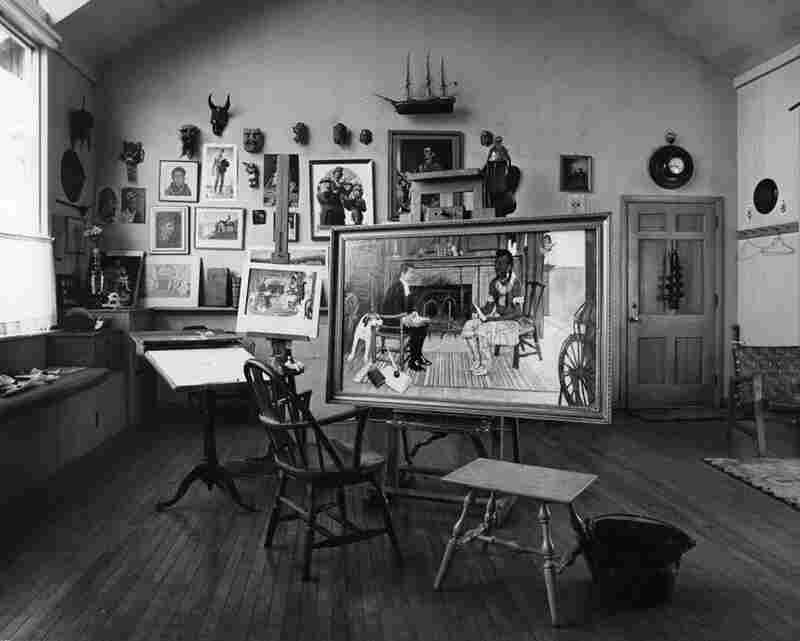 An unfinished painting sits in Rockwell's studio on the day of his death, in 1978. 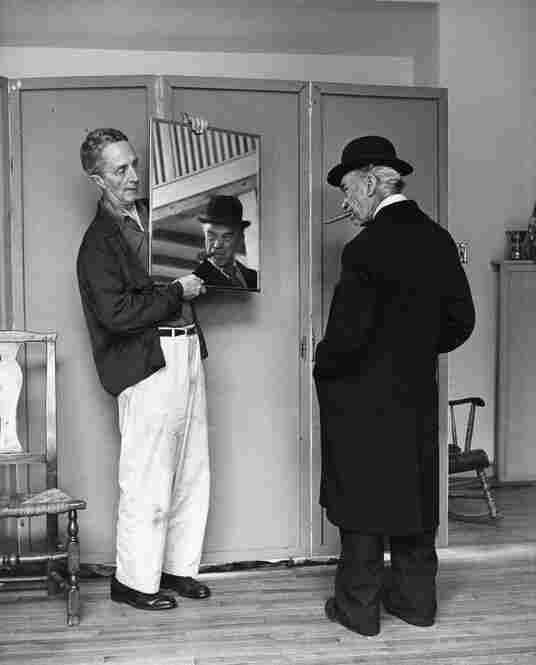 Kalischer says the painting was unfinished because Rockwell did not use photographs for it. Although Rockwell's use of photographs may discredit him in some eyes, it's hard to deny the breadth of Rockwell's aesthetic influence. But others who knew Rockwell have a different opinion. Mary Whalen Leonard, who modeled for several of Rockwell's photographs, has nothing but fond memories and admiration. She spoke to NPR's Jacki Lyden about Rockwell's warm affability, his obsessive eye for detail, his mastery of light and composition and, most of all, his gift as a director. Even if he was a photorealist, he had an artful vision. For years, Rockwell has been dismissed as kitschy and cliched. But lately, critics and collectors alike have reconsidered his work. Directors George Lucas and Steven Spielberg will contribute their Rockwell pieces to a Smithsonian exhibit next year, and one Rockwell painting recently sold for $15 million. Rockwell's rosy America and literalist technique might polarize opinions, but there's no denying the permanence and influence of his vision. And at least now, homage can be paid to the photographers who made that vision a reality. There are stories — and then there are stories. To visit Stockbridge, Mass., is to see Norman Rockwell's subjects walking around. You look at a face and think, "Could it be?" And upon occasion, it is, indeed. Rockwell had so many of his townsmen photographed for his paintings that the Town Hall is setting up an exhibit, asking people to identify themselves. The Town Hall is in the old school in which Rockwell, with the principal's help, photographed so many children. That would be a far more difficult thing to do today. Also, the rediscovery of the very fact that Rockwell used photography so precisely is fascinating — and we owe Ron Schick and the Norman Rockwell Museum for their work. Clemens Kalischer, a world-renowned photographer, did not want to be identified as a Rockwell photographer, and shouldn't be. Though the two were neighbors, they had little in common by way of aesthetics.